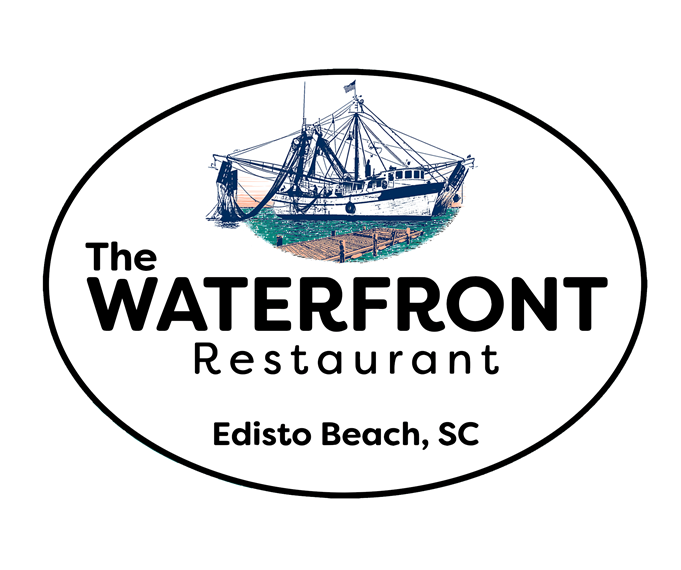 A Waterfront specialty! A baked handmade crab cake made with fresh crab meat & served with our house remoulade. Hot crab & artichoke dip served with house-made pita chips. Mozzarella cheese breaded, fried & served with marinara sauce. 1/2 lb. of shrimp hand breaded & fried golden brown. Juicy chicken breast strips fried & served with honey mustard dipping sauce. Lightly fried, then topped with shredded parmesan cheese & served with marinara sauce. Your choice: plain, hot, mild, teriyaki, hotyaki, honey bbq & lemon pepper. Served with ranch or blue cheese. A lowcountry favorite! Green tomatoes lightly breaded & fried. Served over creamy grits with our remoulade sauce. Fresh oysters lightly breaded & fried crispy. Made from scratch daily, full of lump crab meat and finished with a touch of sherry, It's a Waterfront favorite! Served with fresh vegetables. Substitute a fresh garden salad for 3.99. Fettuccini pasta tossed in creamy alfredo sauce & topped with grilled shrimp or chicken & parmesan cheese. Sautéed shrimp with basil pesto and sundried tomatoes, served over penne pasta. Fettuccine pasta tossed in creamy alfredo and topped with mushrooms, broccoli and tomatoes. Sautéed chicken tossed in our homemade marinara sauce, with fresh mozzarella cheese served over penne pasta. Pan sauteed scallops simmered in a cream sauce with shallots, roasted tomatoes, & bacon then served over a bed of fettuccini noodles. Fresh shrimp topped with tasso gravy & served over creamy stone ground grits. 12 ounces of ground beef seasoned & grilled then topped with sauteed peppers & onions. "The whole shabang" pecan fried with an apricot shallot sauce. Roasted grouper filet with a crispy parmesan and horseradish topping. Served fresh vegetables and choice of one side. Substitute a fresh garden for 3.99. Crab legs steamed & served with melted butter. An 8 oz. sesame-encrusted tuna steak, seared &topped with a teriyaki glaze. A fresh filet of Atlantic salmon flavored with lemon & dill and baked with spinach & goat cheese stuffing. Topped with hollandaise sauce. The Waterfront's own recipe of fresh crabmeat and special ingredients, topped with our house remoulade sauce. Juicy, plump oysters lightly breaded & fried crispy. Fresh shrimp seasoned & grilled or lightly breaded and fried golden brown. Sea scallops seasoned & broiled or fried to perfection. Fresh flounder filet seasoned & broiled or lightly breaded & fried crispy. Fried Oysters or a Crab Cake. Served with fresh vegetables and choice of one side. Substitute afresh garden salad for 3.99. The classic cut, seasoned and grilled to perfection. Add grilled shrimp to your steak for an additional 4.99. An 8 oz. chicken breast grilled, glazed with bar-b-que sauce & topped with onions, bacon & cheddar cheese. Salad Dressings: Balsamic Vinaigrette, Blue Cheese, Honey Mustard, Ranch, Thousand Island. A smaller bed of salad greens, cucumbers, tomatoes, onions, cheddar cheese & sunflower seeds. Make any sandwich your own. Flounder filet fried golden brown and served on a sesame seed bun. An 8-oz chicken breast seasoned, grilled and served on a sesame seed bun. A juicy half pound of certified angus beef dusted with cajun spices, topped with blue cheese & grilled to perfection, served on a sesame seed bun. A lowcountry favorite! A juicy half pound of certified angus beef seasoned, grilled to perfection & topped with pimiento cheese, served on a sesame seed bun. A juicy half pound of certified angus beef seasoned & grilled to perfection, served on a sesame seed bun. Free refills on tea, coffee and fountain drinks only.